The Parkpnp app and website allow owners of parking places to list their spaces as available to rent. Drivers can search the Parkpnp marketplace for the best value or location for their cars. There are thousands of spaces listed throughout Dublin and over 10,000 people per week are searching for parking on Parkpnp. Already in Swords you can see home owners have listed their driveways, as have owners of commercial car parks, offering great value parking to drivers seeking an alternative to the traditional parking locations. Listing a space is free on Parkpnp, so why not join the parking revolution? Parking In Swords And How Much It Costs. Pay and display is in operation from The Estuary Pub on North Street to Pinnock Hill Roundabout, a distance of km1.5. The charge per hour is €1 . All day parking is not allowed on Main Street. The hours of operation are from 8.00 am to 6.00 pm, Monday to Saturday. It's free to park after 6pm and all day Sunday. Parking along this stretch outside Eddie Rockets is managed by a private company. If you don't pay for parking along here you may get clamped. When entering the Pavilions shopping centre you'll go through a barrier and receive a ticket. You must validate this ticket at the exit door [Vodafone store side] to be able to get your car out. It's free to park here but the gate gets closed when the shop closes, so if you leave your car here you wont be able to get it until 9am the following day. No Clamping Here. There is no parking allowed on the road where the mall is. If you do decide to park along this road there's a good chance you'll get clamped within 5 minutes as the clamping van is always nearby. The Chapel lane operates a pay and display system. It's €1 per hour. There are several ticket machines located on this road from The Star Pub to St. Colmcilles National School. The hours of operation are from 8.00 am to 6.00 pm, Monday to Saturday. It's free to park after 6pm and all day Sunday. 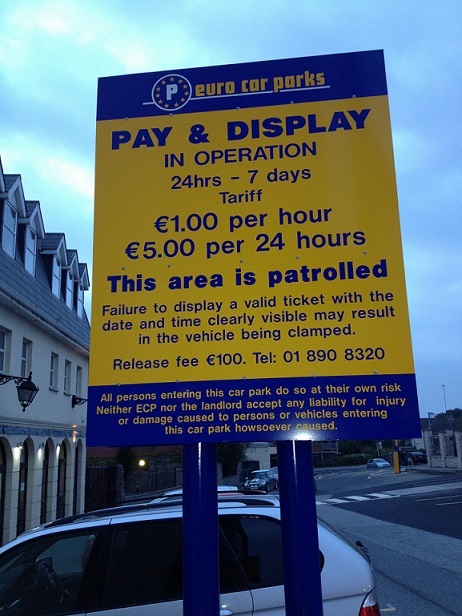 As with the Main Street this pay and display is operated by Fingal County Council with parking wardens on the lookout from 9am to 6pm. No Clamping. In the car park behind the star the charges are €1 per hour and it's in operation 24 hours a day. There is clamping in operation with the release fee being €100. The company who operate this place on behalf of Fingal Council are Euro Car Parks. Phone 01 8908320 should you need to get a clamp released. €5 will get you all day parking. If you do not display a ticket while parking along Main Street or Chapel Lane or if the time on the ticket runs out you stand a good chance of getting a €40 ticket. If you park in a disable bay you will be fined €80 if you are not displaying a disable sign on your dashboard. It's free to park in The Estuary Pub Car park if you are customer using the pub to eat or drink. Remember to ask the bar staff for a display card to place on the dashboard of your car. If you do decide to park in the car park and you are not using the pub you may get clamped. The release fee for the clamp is €120. There are signs warning about clamping in the car park. The management had little choice in implementing this action as drivers who were working nearby and those using the café and betting office were clogging up the few spaces available which left no room for the customers of the pub. Parking In The Underground Car Park. There is an underground park on New Street which runs parallel with Main Street. It costs €1 per hour. or €4 per day. You pay the charge when you return to the car park at the machine. Parking is free to customers who are using the pub to eat or drink. A Pay And Display system is in operation. Airside Retail Park. This area is free for shoppers all day. But if you park here over night you may get clamped. Example is anybody using this place while going to The Wright Venue and decides to leave their car over night in the retail park. Others who have used it as a Park And Ride area while getting the bus into the city have also being clamped. There's a loading bay outside Audrey's shop near The Carnegie Court Hotel. It's hours of operation are 8am - 6pm Monday - Saturday. Another loading bay is located close to the 44 hotel which also operates 8am - 6pm Mon. to Sat. The loading bay outside Centra on the main street operates from 7am - 10am Mon. to Sat. Another ''Shared'' loading bay is on the left facing Swords Castle. This bay is shared with Dublin Bus as a bus stop / loading area. A loading area is strictly for those who are loading or unloading goods using commercial vehicles. If you use these spaces and are not seen to be loading, even if it's a commercial vehicle you may get a ticket. It's an offence to park in a disabled bay anywhere in Ireland. Be it a street, shopping centre, hotel even if it's on private property. The Garda have the right to issue a ticket to anybody parking in these disabled areas who don't display the disable card on the window / dashboard. People assume because it's a shopping centre and they are only popping in for a few minutes that its alright. Wrong. Private car parks require planning permission which may be subject to conditions. Such conditions have to relate to the proper planning and sustainable development of the area, as set out in the County Development Plan. The opening hours of a private car park may be considered as part of the planning consent process, in that they may impact on residential amenity. However, the enforcement process in a private car park, has no impact on proper planning or sustainable development and is, therefore, not appropriate for conditions. restaurants, and pubs. The effect of the Motion could be to reduce the commercial viability of the business, for no planning reason. Such a condition might be open to a claim for compensation. In summary, it would be inappropriate to impose a condition that effectively requires a business to provide its services free-of-charge for significant periods of time each week. It should also be noted that it there is no process by which the Council could unilaterally and retrospectively apply such a condition to an existing car park.